Here's what investors need to know about Carvana's mixed third-quarter results. Shares of Carvana Co. (NYSE:CVNA), an online automotive retail platform offering vehicle delivery or pickup from its automated car vending machines, are soaring 15% as of 9:43 a.m. EST Thursday after the company reported its third-quarter results. 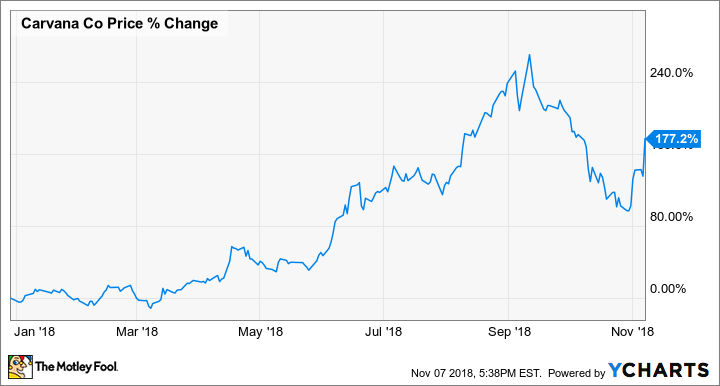 Carvana's stock price has cooled a bit over the past couple of months after more than doubling in 2018, and shares are moving higher again following explosive growth during the third quarter. Retail units sold jumped 116% compared to the prior year, which drove revenue 137% higher over the same time period, to $535 million. With such robust growth comes higher expenses, and Carvana's net loss during the third quarter widened to $64.4 million, an increase of 62%. Its adjusted per-share loss checked in at $0.40, $0.03 worse than analysts' estimates. The company's $535 million in revenue topped analysts' estimates by $25.6 million. Total gross profit jumped 181% to $57 million and it was the company's 19th consecutive quarter of triple-digit year-over-year unit and revenue growth -- quite an impressive feat. "To put that growth in perspective, we delivered more cars to our customers in Q3 than we did in all of 2015 and 2016, combined," said Ernie Garcia, Carvana founder and CEO, in the press release. Philadelphia's Carvana automated vending machine. Image source: Carvana Co.
Investors will want to watch if Carvana can continue expanding while improving key metrics, such as its gross profit per unit (GPU). During the third quarter, total GPU ex-Gift -- in celebration of its 100,000th sold vehicle, the company is giving each current employee 165 shares of Carvana at their one-year anniversary, which slightly impacts some metrics -- jumped from the prior year's $1,742 to $2,302. Q3 GPU was its highest ever quarterly total and gives shareholders confidence that Carvana can reach its $3,000 goal. For now, investors are clearly pleased with explosive top-line growth, even with widening bottom-line losses, as long as the company is improving its brand awareness, consumer reach, and GPU.